This California pepper was located in a parking lot. 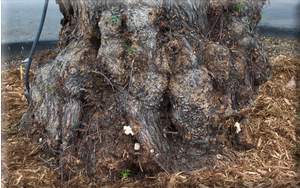 The base of the trunk had Ganoderma spp. conks around 60% of its circumference (lower left photo) indicating extensive internal decay. 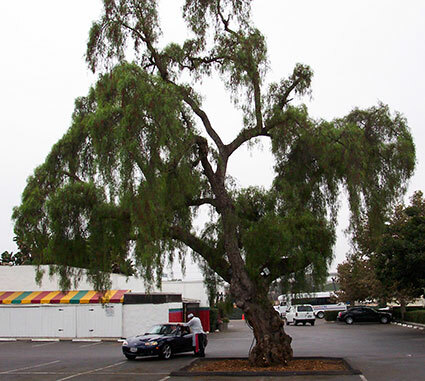 The tree was recommended for removal using VTA. Below is the remaining stump. The whitish wood is structurally sound wood while the yellowish colored wood is the Ganoderma infected wood. 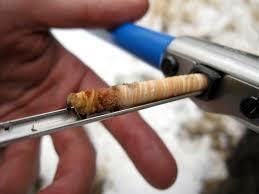 The infected wood is spongy and weak and would have resulted in complete tree failure. 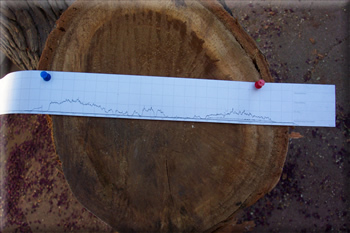 The graph to the right was taken at the base of the above California pepper with the Resistograph. It shows about 1.5 inches of solid wood on the outside with decayed wood on the inside. Two other drillings showed similar decay. Because of decay detection and evaluation, the tree was removed before it fell. The Resistograph is one of many decay detection techniques. 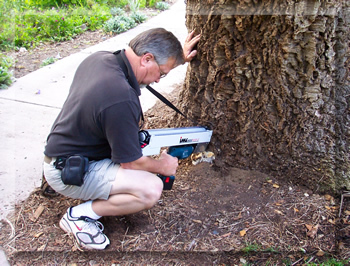 It helps the arborist to better “see” inside the trunk for advanced decay and/or cavities that may result in tree failure without removing what may still be a solid tree. WHAT IS A RESISTOGRAPH AND HOW DOES IT WORK? A Resistograph is a sensitive device that drills a small hole (>.125 inch in diameter) measuring the resistance of the wood to the drill bit and recording this measurement as a graph (see the above & lower photos). The less resistance the softer the material. The graph is then interpreted by the arborist. 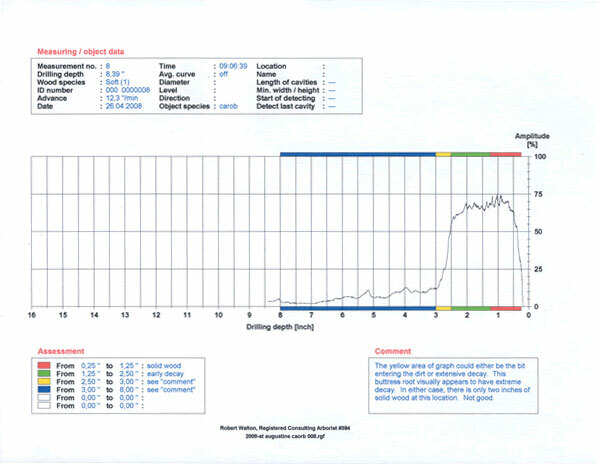 The drilling graph (below) shows how 3 to 4 inches of outside trunk-wood of this flaming flowered eucalyptus was solid but the center was decayed with some solid wood dead center. As the decay continues there will come a time when the decreasing percentage of solid wood will be unable to support the stresses of the tree and it will fail. Decay detection & evaluation can give some forewarning. The electronic unit on the Resistograph 400se can also generate the computerized version seen above. WHEN IS A RESISTOGRAPH APPROPRIATE? Should I request one be brought to my consultation? The appropriate use of a Resistograph is usually determined by VTA (Visual Tree Assessment) criteria, such as visible cavities, conks (fungal fruiting bodies), etc. that would indicate possible interior decay. A Resistograph's use is not always appropriate due to its invasiveness and/or limitations. Its usefulness is determined by the arborist at the time of inspection. As this equipment is not normally brought to a consultation, the customer may request it, so that it's available if needed. The Swedish Increment Bore (seen to the left with extractor) is a tool used to extract a core sample of wood without major damage to the core's source. When used by the arborist, in appropriate situations, it can tell you things about the inner condition of the source that cannot be found any other way. To the left is a core sample setting within the extractor. 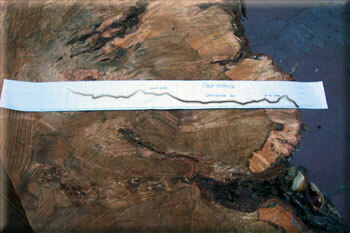 Though the wood showed solid with the Resistograph, the sample indicates the early stages of decay. Visual Tree Assessment, the Air‑Spade, the Resistograph and the Swedish Increment Bore are all tools of a comprehensive evaluation. 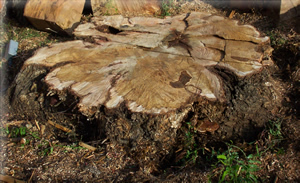 An evaluation, while not absolute, can find many tree defects before they become a problem. If you are concerned about the safety of your trees or still have questions please give us a call.